Multidrug resistance protein MRP1 mediates the ATP-dependent efflux of many chemotherapeutic agents and organic anions. MRP1 has two nucleotide binding sites (NBSs) and three membrane spanning domains (MSDs) containing 17 transmembrane helices linked by extracellular and cytoplasmic loops (CL). Homology models suggest that CL7 (amino acids 1141-1195) is in a position where it could participate in signaling between the MSDs and NBSs during the transport process. We have individually replaced eight charged residues in CL7 with Ala, and in some cases, an amino acid with the same charge, and then investigated the effects on MRP1 expression, transport activity, and nucleotide and substrate interactions. A triple mutant in which Glu1169, Glu1170, and Glu1172 were all replaced with Ala was also examined. The properties of R1173A and E1184A were comparable with those of wild-type MRP1, whereas the remaining mutants were either poorly expressed (R1166A, D1183A) or exhibited reduced transport of one or more organic anions (E1144A, D1179A, K1181A, 1169AAQA). Same charge mutant D1183E was also not expressed, whereas expression and activity of R1166K were similar to wild-type MRP1. The moderate substrate-selective changes in transport activity displayed by mutants E1144A, D1179A, K1181A, and 1169AAQA were accompanied by changes in orthovanadate-induced trapping of [α-32P]azidoADP by NBS2 indicating changes in ATP hydrolysis or release of ADP. In the case of E1144A, estradiol glucuronide no longer inhibited trapping of azidoADP. Together, our results demonstrate the extreme sensitivity of CL7 to mutation, consistent with its critical and complex dual role in both the proper folding and transport activity of MRP1. ABC (ATP-binding cassette) transporters are large polytopic membrane proteins found in all species, from bacteria to man, that actively transport multiple substrates of remarkable chemical diversity across biological membranes. In humans, there is considerable evidence that several ABC transporters, including multidrug resistance protein 1 (MRP1/ABCC1), contribute to the resistance of certain tumor types to cytotoxic drugs used during chemotherapy as well as the disposition of these agents in normal tissues (Leslie et al., 2005; Deeley et al., 2006). MRP1 also mediates the ATP-dependent efflux of a wide variety of conjugated and unconjugated organic anions derived from both endogenous and exogenous sources. MRP1 is composed of a four-domain core structure containing two membrane-spanning domains (MSDs), each containing six transmembrane segments (TMs) and two nucleotide binding domains (NBDs), plus a third NH2-proximal MSD (MSD0) with five TMs whose function is not yet fully understood although MRP1 lacking MSD0 is still transport competent (Bakos et al., 2000; Westlake et al., 2003). The two MSDs of the core structure form the substrate translocation pathway through which drugs and other MRP1 substrates are exported from the cell, whereas the NBDs associate in a head-to-tail orientation to form a “sandwich” dimer that comprises two composite nucleotide binding sites (NBSs). The two NBSs, each composed of the Walker A and Walker B motifs from one NBD and the ABC-signature motif from the other NBD, are responsible for the binding and hydrolysis of ATP, which provides the energy necessary for the transport process (Locher et al., 2002). The 17 TMs of MRP1 are linked to one another by either extracellular or cytoplasmic loops. The extracellular NH2-terminal sequence of MRP1 and the extracellular loop connecting TM12 to TM13 contain Asn residues that are known to be N-glycosylated in the mature protein when it is expressed in mammalian cells (Hipfner et al., 1997). However, N-glycosylation does not seem critical for the plasma membrane expression or activity of this transporter (Müller et al., 2002). On the other hand, several cytoplasmic loops of MRP1 contain functionally important amino acids as demonstrated by analyses of MRP1 mutants. For example, although the NH2-truncated 4-domain core structure of MRP1 lacking MSD0 is able to transport the high-affinity MRP1 substrate cysteinyl leukotriene C4 (LTC4), this activity is lost when the third cytoplasmic loop (CL3; also referred to as L0) linking MSD0 and MSD1 is deleted from the core (Bakos et al., 1998, 2000; Gao et al., 1998). In addition, internal deletions (including residues 208-260) and mutations of certain Pro, Cys, and Trp residues within CL3 partially or wholly inactivate MRP1; in some cases, the mutation impairs appropriate trafficking of MRP1 to the plasma membrane (Ito et al., 2003; Leslie et al., 2003a; Westlake et al., 2003). Thus it seems that CL3 interactions with hydrophobic regions of the plasma membrane and with the core structure of MRP1 are important for the function of this transporter. Secondary structures, homology models, and sequence alignments of MRP1 and CL7. A, a predicted secondary structure of MRP1 showing the location of CL7 (defined here as amino acids 1141 to 1195) and the location of predicted α-helix-spanning amino acids 1162 to 1176 in this region. B, three-dimensional model of MRP1 (lacking MSD0) generated using the crystal structure of Sav1866 from S. aureus as template (DeGorter et al., 2008) showing putative location of CL7 (darkened and circled) and coupling helix 2 (dotted circle) spanning amino acids 1161 to 1170. C, sequence alignments of ABCC family members generated using ClustalW (http://npsapbil.ibcp.fr/cgi-bin/npsa_automat.pl?page=/NPSA/npsa_clustalw.html). Residues that are strictly conserved in all ABCC transporters are shown on a black background, whereas residues that are partially conserved are on a gray background. SUR, sulfonylurea receptor; CFTR, cystic fibrosis transmembrane conductance regulator. In addition to CL3, there is strong evidence that the seventh, most COOH-terminal cytoplasmic loop, CL7, which links TM15 to TM16 in MSD2, plays an important role in MRP1 expression and function (Fig. 1A). This was first demonstrated by the observation that insertion of a hemagglutinin epitope tag at amino acid position 1175 prevented expression of an active transporter (Kast and Gros, 1998). More recently, we showed that mutation of two adjacent Tyr residues in CL7 affected MRP1 activity, especially with respect to the transport of the sulfhydryl-reducing antioxidant GSH (Conseil et al., 2005). In addition, mutations of Pro1150 close to the predicted interface of CL7 and TM15 caused significant changes in the substrate specificity of MRP1 as well as its interactions with ATP and ADP (Koike et al., 2004; Létourneau et al., 2008). CL7 also contains several clusters of charged residues that we have earlier hypothesized are important for transport of anionic and possibly other substrates of MRP1, because of the role this region is believed to play in signaling between the MSDs and NBSs during the transport process (Fig. 1A) (Conseil et al., 2006). In support of this hypothesis, we have demonstrated that opposite charge substitutions of Arg1138 and Arg1142 result in reduced MRP1 activity that is associated with reduced substrate binding as well as altered interactions with ATP. Substitution of Lys1141 with Glu also impairs expression of MRP1 at the plasma membrane as well as adversely affecting transport activity (Conseil et al., 2006). Thus, these basic residues at the NH2-proximal end of CL7 play an important and apparently complex role in both the expression and transport mechanism of MRP1. In the present article, we have extended our structure-function analyses of CL7 by investigating the importance of 1) an acidic residue, Glu1144, immediately COOH-proximal to the cluster of basic residues investigated previously (Conseil et al., 2006); and 2) a series of charged residues further COOH-proximal to this region, including Arg1166, Arg1173, Asp1179, Lys1181, Asp1183, and Glu1184. These seven residues were replaced individually with Ala and, in some cases, an amino acid with the same charge, and then the effects on MRP1 plasma membrane expression, transport activity, and nucleotide interactions were determined. We also investigated the role of a negatively charged “patch” of amino acids in the same region of CL7 by characterizing a triple mutant in which Glu1169, Glu1170, and Glu1172 were all replaced with Ala. The results obtained indicate that these charged residues of CL7 each have a distinct role that can be critical not only for stable expression of MRP1 at the plasma membrane but also for its transport activity by affecting substrate binding and/or nucleotide interactions. Materials. [14,15,19,20-3H(n)]LTC4 (160 Ci/mmol), [6,7-3H(n)]E217βG (45 Ci/mmol), [6,7-3H(n)]estrone 3-sulfate ammonium salt (46 Ci/mmol), and [glycine-2-3H]GSH (52 Ci/mmol) were from PerkinElmer Life and Analytical Sciences (Waltham, MA). [3′,5′,7-3H(n)]Methotrexate disodium salt (33.5 Ci/mmol) was from Moravek Biochemicals, Inc. (Brea, CA). 8-Azido-[α-32P]ATP (11.9 Ci/mmol) was from ALT BioScience (Lexington, KY). LTC4 was purchased from Calbiochem (La Jolla, CA) and nucleotides, GSH, apigenin, acivicin, E217βG, E13SO4, leupeptin, and PMSF were purchased from Sigma Chemical Co. (St. Louis, MO). Secondary Structure Predictions of MRP1. Algorithms used for secondary structure predictions of MRP1 included SOPM, HNN, DPM, DSC, GOR IV, PHD, PREDATOR, and SIMPA96, which can be found (with references) at http://npsa-pbil.ibcp.fr/cgi-bin/npsa_automat.pl?page=/NPSA/npsa_seccons.html. Vector Construction and Site-directed Mutagenesis. Mutations in MRP1 were generated using the QuikChange site-directed mutagenesis kit (Stratagene, La Jolla, CA). The template for mutagenesis was prepared by cloning a 2-kb XmaI fragment (nucleotides 2337-4322) from pcDNA3.1(-)-MRP1k into pGEM-3Z (Promega, Madison, WI) (Ito et al., 2001). Mutations were first generated in the pGEM-3Z-XmaI/MRP1 plasmid according to the manufacturer's instructions with the following mutagenic primers (Integrated DNA Technologies, Inc., Coralville, IA), which also introduced an additional restriction site (substituted nucleotides are underlined): E1144A (5′-G AAG CGC CTC GCG TCG GTC AGC-3′); R1166A (5′ C AGC GTC ATT GCA GCA TTC GAG GAG CAG-3′); R1166K (5′ C AGC GTC ATT AAG GCC TTC GAG G-3′); 1169EEQE-1169AAQA (5′-C ATT CGA GCC TTC GCG GCA CAG GCA CGC TTC ATC C-3′); R1173A (5′-C GAG GAG CAG GAG GCA TTC ATC CAC CAG AG-3′); D1179A (5′-C CAC CAG AGT GCC CTT AAG GTG GAC G-3′), K1181A (5′-G AGT GAC CTG GCA GTC GAC GAG AAC C-3′); D1183A (5′-CTG AAG GTG GCC GAG AAC CAG-3′); D1183E (5′-CTG AAG GTG GAA GAG AAC CAG-3′); and E1184A (5′-GT GAC CTG AAG GTA GAC GCG AAC CAG AAG GCC-3′). After confirming all mutations by diagnostic restriction enzyme digests, a 0.4-kilobase pair Eco47III/NcoI fragment containing the desired mutation was subcloned into another pGEM-3Z-XmaI/MRP1, and then a 1.5-kilobase pair BsmBI/ClaI fragment containing the desired mutation was subcloned back into pcDNA-3.1(-)-MRP1k. The fragments in the full-length constructs were sequenced to confirm the integrity of the sequence and the presence of the mutation. Cell Transfections and Protein Preparations. Wild-type and CL7 mutant pcDNA3.1(-)-MRP1 expression vectors were transfected into simian virus 40-transformed human embryonic kidney cells (HEK) 293T (Ito et al., 2001). Transfections were initially done in six-well plates seeded with 106 cells per well using 4 μg of DNA combined with Lipofectamine 2000 (Invitrogen, Scarborough, ON, Canada) according to the manufacturer's instructions. After 48 h, whole-cell lysates were prepared by resuspending cell pellets in lysis buffer containing 50 mM Tris-HCl, pH 7.4, 10 mM MgCl2, 250 μg/ml DNaseA (GE Healthcare, Baie d'Urfé, QC, Canada), 5 μg/ml PMSF, 0.25% SDS, and protease inhibitor solution (Roche Biochemicals, Laval, QC, Canada). After centrifugation at 15,000 rpm for 10 min at 4°C, proteins in the supernatant were quantified by the detergent-compatible protein assay (Bio-Rad Laboratories, Mississauga, ON, Canada). In subsequent studies of expressing MRP1 mutants, 18 × 106 HEK 293T cells were seeded in 150-mm plates and transfected 24 h later (at 50-80% confluence) with DNA (16 μg) using FuGENE6 (Roche Diagnostics) according to the manufacturer's instructions. After 72 h, the HEK 293T cells were harvested, and membrane vesicles were prepared as described previously (Ito et al., 2001). The total protein content of transfected cells was quantified using a Bradford assay (Bio-Rad). Untransfected cells and cells transfected with a wild-type MRP1 cDNA expression vector were included as controls in all experiments. Measurements of MRP1 Protein Levels in Transfected Cells. The levels of wild-type and mutant MRP1 proteins, in whole-cell lysates and membrane vesicles, were determined by immunoblot analysis using the human MRP1-specific murine mAb QCRL-1 (diluted 1:5000-1:10,000) essentially as described previously (Conseil et al., 2006). Relative levels of MRP1 expression were estimated by densitometry using ImageJ software (http://rsb.info.nih.gov/ij/index.html). To confirm equal loading of protein, blots were stained with amido black. ATP-Dependent MRP1-Mediated Uptake of 3H-Labeled Substrates in Membrane Vesicles. ATP-dependent uptake of 3H-labeled substrates by the membrane vesicles was measured using a modified rapid filtration method (Loe et al., 1996) adapted to a 96-well microtiter plate format (Létourneau et al., 2005). LTC4 transport assays were performed at 23°C in a 50-μl reaction volume containing 1.8 μg of membrane vesicle protein, 50 nM [3H]LTC4 (20 nCi per reaction), 10 mM MgCl2, 4 mM ATP, or 4 mM AMP, in transport buffer (250 mM sucrose and 50 mM Tris-HCl, pH 7.5), with an ATP regenerating system. MRP1-mediated uptake was stopped at selected times by rapid dilution in ice-cold transport buffer and the reaction was filtered through a UniFilter GF/B plate (PerkinElmer Life and Analytical Sciences, Mississauga, ON, Canada). Tritium associated with the vesicles was counted on a Top Count NXT Microplate Scintillation and Luminescence Counter (PerkinElmer Life and Analytical Sciences). ATP-dependent LTC4 uptake was calculated by subtracting the uptake in the presence of AMP from the uptake measured in the presence of ATP. Unless specified otherwise, all transport assays were carried out in triplicate, and results were expressed as means ± S.D. and corrected for any differences in expression of the mutant MRP1 proteins relative to wild-type MRP1. Uptake of [3H]E217βG was measured in a similar fashion except that membrane vesicles (1.8 μg of protein) were incubated at 37°C in a total reaction volume of 50 μl containing 400 nM [3H]E217βG (40 nCi per reaction) and the components as described for [3H]LTC4. [3H]E13SO4 uptake was performed at 37°C in a 50-μl total reaction volume containing membrane vesicles (1.8 μg protein), 300 nM E13SO4 (100 nCi), 3 mM GSH, 10 mM DTT, and the same components described above. Apigenin-stimulated [3H]GSH uptake was also measured by rapid filtration with membrane vesicles (20 μg protein) incubated at 37°C for 20 min in a 60-μl reaction volume with 100 μM [3H]GSH (120 nCi per reaction, with 10 mM DTT) and 30 μM apigenin (Leslie et al., 2003b). To minimize GSH catabolism during transport, membranes were preincubated with 0.5 mM acivicin for 10 min at 37°C before measuring [3H]GSH uptake (Leslie et al., 2003b). [3H]MTX uptake was carried out at 37°C for 20 min in a 50-μl reaction volume containing membrane vesicles (5 μg of protein), 100 μM MTX (200 nCi per reaction), and other components as above (Létourneau et al., 2005). Photolabeling of MRP1 by [3H]LTC4. Wild-type and mutant MRP1 proteins from transfected cells were photolabeled with [3H]LTC4 essentially as described previously (Loe et al., 1996). In brief, vesicles prepared from HEK 293T cells transfected with wild-type and mutant MRP1 cDNAs (40 μg protein in 50 μl) were incubated with [3H]LTC4 (120 nCi; 200 nM) and 10 mM MgCl2 at room temperature for 30 min and then frozen in liquid nitrogen. Samples were then alternately irradiated at 302 nm for 1 min and snap-frozen 10 times in liquid N2. Radiolabeled proteins (40 μg) were resolved by SDS-PAGE, and the gel was processed for fluorography. The gel was exposed to Bioflex MSI film (InterScience, Troy, NY) for approximately 2 days at -70°C. Photolabeling of MRP1 by 8-Azido-[α-32P]ATP. Wild-type and mutant MRP1 proteins from transfected cells were photolabeled with 8-azido-[α-32P]ATP essentially as described previously (Koike et al., 2004). Membrane vesicles (20 μg of protein) were dispersed in 20 μl of transport buffer containing 5 mM MgCl2 and 5 μM 8-azido-[α-32P]ATP. After 5 min on ice, the samples were exposed to light at 302 nm on ice for 8 min. The reactions were stopped by the addition of Tris-EGTA buffer (50 mM Tris-HCl, pH7.4, 0.1 mM EGTA, and 5 mM MgCl2), and the membranes were washed and resuspended in 20 μl of transport buffer. Membrane proteins were then solubilized in Laemmli buffer and subjected to SDS-PAGE and exposed to film as before. Orthovanadate-Induced Trapping of 8-Azido-[α-32P]ADP by MRP1. To measure orthovanadate-stabilized trapping of azidoADP, wild-type and mutant MRP1 proteins from transfected cells (20 μg) were incubated in transport buffer (20 μl) containing 5 mM MgCl2 and 1 mM freshly prepared sodium orthovanadate with 5 μM 8-azido-[α-32P]ATP at 37°C for 15 min. The reactions were stopped by the addition of Tris-EGTA buffer followed by centrifugation and washing, and the membrane pellets were resuspended in 20 μl of transport buffer. The samples were transferred to a 96-well plate, irradiated at 302 nm, subjected to SDS-PAGE and exposed to film as before (Koike et al., 2004). In some experiments, membranes were subjected to limited digestion with trypsin after vanadate-induced trapping of 8-azido-[α-32P]ADP. Thus, samples were incubated for 10 min at 23°C with diphenylcarbamyl chloride-treated trypsin (MP Biomedicals, Solon, OH) at a trypsin-to-protein ratio of 1:1000 (w/w). Proteolysis was stopped by placing samples on ice and adding PMSF (10 mM) and leupeptin (16.7 μg/ml) in Laemmli buffer. Samples were then resolved by electrophoresis on a 5 to 15% gradient gel and exposed to film as before. Sequence Alignment and Secondary Structure Predictions of CL7. Depending on the algorithm used to predict the topology of MRP1 (and therefore the locations of TM15 and TM16), the boundaries of CL7 can vary somewhat. For the purposes of this study, we have defined CL7 as extending from Lys1141 to Ala1195 (Fig. 1A). Several algorithms predict that CL7 contains a single short α-helix, with the consensus indicating that it spans from Val1162 to His1176 and thus encompasses Arg1166 and Arg1173 as well as the acidic cluster, 1169EEQE, whereas the remaining amino acids investigated in this study reside in the flanking regions (Fig. 1A). However, our recent homology models of MRP1 based on the crystal structure of Sav1866 from Staphylococcus aureus indicate that the α-helix containing TM15 extends into the cytoplasm to become CL7 (Fig. 1B) (DeGorter et al., 2008). This long α-helix is then “disrupted” by Gly1161, which initiates a turn, and a new α-helix begins at Glu1170 and then continues until it inserts into the membrane bilayer as TM16. CL7 is extremely well conserved among mammalian orthologs (>98% identity) (Fig. 1C) and is characterized by the presence of multiple charged residues, many of which occur in clusters creating ionic “patches” in this region of MRP1/Mrp1. Among the MRP homologs, the most strictly conserved residues investigated in this study are Arg1166 and Asp1183, which are present in almost all other ABCC family members (Fig. 1C). Glu1144 is also highly conserved, although another acidic residue, Asp, is often found in its place. Residues Arg1173, Asp1179, and Lys1181 are moderately conserved, at least with respect to their polarity if not their charge, whereas Glu1184 is rather poorly conserved. The negatively charged cluster of 1169EEQE seems quite specific to MRP1/Mrp1 because this trio of acidic residues is not found in any of the MRP1 homologs (Fig. 1C). Expression of MRP1 Mutant Proteins. After transfection with cDNA expression vectors encoding either wild-type MRP1 or MRP1 containing single substitutions, MRP1 levels in whole-cell lysates were determined by immunoblot analysis using the MRP1-specific mAb QCRL-1. These experiments showed that two of the Ala-substituted mutants (R1166A and D1183A) were consistently expressed at very low levels (10-20% of wild-type MRP1) (Fig. 2A). Levels of MRP1 mRNA in cells expressing the Arg1166 and Asp1183 mutants were comparable with those of cells expressing wild-type MRP1 (data not shown), indicating that the differences in MRP1 protein expression are due to a post-transcriptional event(s). The properties of these poorly expressing Arg1166 and Asp1183 mutants are discussed below. The expression levels of the remaining singly substituted CL7 mutants (Glu1144, Arg1173, Asp1179, Lys1181, and Glu1184) and the triple mutant 1169AAQA were comparable with or greater than that of wild-type MRP1, and their properties are discussed subsequently. Confocal microscopy of intact HEK cells using the MRP1-specific mAb QCRL-3 showed that despite their low expression levels, at least a portion of the R1166A and D1183A mutant proteins were correctly routed to the plasma membrane (not shown). Because previous studies on the chloride channel CFTR (ABCC7) have shown that plasma membrane expression of the disease-causing trafficking mutant ΔPhe508-CFTR can be rescued by incubating cells expressing this mutant at subphysiological temperatures (Fanen et al., 1997), we tried to enhance expression of these mutant MRP1 proteins by incubating the transfected cells at 28°C rather than 37°C. However, even at the lower temperature, expression of the R1166A and D1183A mutants remained substantially below that of wild-type MRP1; furthermore, plasma membrane routing of the mutants as well as wild-type MRP1 was impaired (data not shown). Expression also remained low after exposure of the transfected cells to sodium butyrate (5 mM), an agent shown previously to enhance plasma membrane expression of ΔPhe508-CFTR as well as MRP2 (ABCC2) (Fanen et al., 1997; Cui et al., 1999). MRP1 protein expression in HEK 293T cells transfected with Arg1166 and Asp1183 mutant cDNA constructs. A, immunoblot of whole cell lysates (10 μg of protein) prepared from HEK 293T cells transfected with wild-type (WT-MRP1), and R1166A and D1183A mutant MRP1 expression vectors. Untransfected cells were used as a negative control (control). MRP1 levels in whole-cell lysates were detected with mAb QCRL-1, and the relative protein expression levels are shown under the blot and were estimated by densitometry as described under Materials and Methods.B, immunoblots of whole-cell lysates (10 μg of protein) prepared from HEK 293T cells transfected with R1166A/K and D1183A/E mutant and wild-type (WT) MRP1 cDNA expression vectors. MRP1 proteins were detected with mAb QCRL-1 and lysates of untransfected cells were included as a negative control as above. Wcl, whole-cell lysates. Expression and vesicular uptake of 3H-labeled organic anions by same charge Arg1166 and Asp1183 mutants of MRP1. A, representative immunoblot of membrane vesicles (1 μg of protein per lane) prepared from HEK 293T cells transfected with wild-type (WT), R1166K, and D1183E cDNA expression vectors. MRP1 proteins were detected with mAb QCRL-1 and membrane vesicles from untransfected cells were included as a negative control. The relative expression levels in the vesicles are shown under the blot and were estimated by densitometry. B and C, ATP-dependent uptake of [3H]LTC4 (B) and [3H]E217βG (C) was measured in membrane vesicles prepared from HEK 293T cells transfected with wild-type MRP1 (WT-MRP1) and R1166K mutant MRP1 cDNA expression vectors. Uptake values were normalized according to relative levels of mutant versus wild-type MRP1 proteins in the vesicles (A). The results shown are means (± S.D.) of triplicate determinations in a single experiment. Similar results were obtained in at least one additional experiment with vesicles prepared from independently transfected cells. To determine whether it was the charge or other property of the amino acid at positions 1166 and 1183 that was critical for efficient plasma membrane expression of MRP1, same-charge mutants of Arg1166 (R1166K) and Asp1183 (D1183E) were created and again expressed in HEK cells. At 37°C, the MRP1 expression levels in whole-cell lysates were increased to 50% of wild-type MRP1 levels for the D1183E mutant, and for the R1166K mutant, expression was comparable with that of wild-type MRP1 (Fig. 2B). Transport Activity of R1166K and D1183E Mutant MRP1 Proteins. To characterize the transport properties of the same-charge R1166K and D1183E mutants, membrane vesicles were prepared from transfected HEK cells. Although expression of these mutants was significant when measured in whole-cell lysates (90 and 50% of wild-type MRP1, respectively) (Fig. 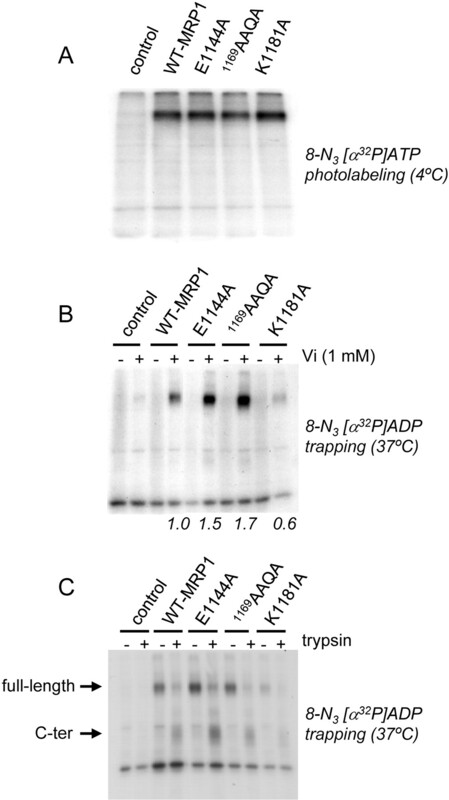 2, bottom), immunoblots of the vesicles indicated that expression was significantly lower in the membrane vesicle preparations (50 and 20% of wild-type MRP1, respectively) (Fig. 3A). However, for the R1166K mutant, levels of LTC4 and E217βG transport (Fig. 3, B and C) were comparable with that of wild-type MRP1 after correcting for relative expression levels of MRP1 in the vesicles. Transport activity of the D1183E mutant was not assessed because its very low expression levels relative to wild-type MRP1 made measurements unreliable (Fig. 3A). Expression and Transport Activity of Remaining Ala-Substituted CL7 Mutant MRP1 Proteins. Immunoblots of whole-cell lysates (not shown) and membrane vesicles prepared from transfected cells expressing the Ala-substituted Glu1144, Arg1173, Asp1179, Lys1181, and Glu1184 single mutants and the triple mutant 1169AAQA showed that these mutants could be expressed at levels very similar to or greater than (0.9- to 2.4-fold) those of wild-type MRP1 (Fig. 4). Furthermore, as shown by confocal microscopy, these mutant proteins were correctly routed to the plasma membrane (not shown). When the ability of these mutants to mediate ATP-dependent vesicular uptake of five MRP1 substrates was examined, several different patterns of activity were observed, and these are summarized in Table 1. Substrate selective decreases in transport activity were observed for the single Glu1144 and Asp1179 mutants as well as the triple 1169AAQA mutant. Thus, E217βG, E13SO4, and MTX transport by E1144A was moderately reduced (by ∼50%), whereas uptake of GSH and LTC4 was comparable with that of wild-type MRP1. The D1179A mutant exhibited a selective but modest reduction (35% decrease) in LTC4 and E13SO4 transport, whereas the 1169AAQA triple mutant showed a more substantial decrease (55%) in E13SO4 transport. On the other hand, the K1181A mutant exhibited a global reduction (∼50%) in transport of all tested organic anion substrates. Finally, no significant alterations in transport activity were caused by Ala substitution of either Arg1173 or Glu1184 (Table 1). For this reason, the R1173A and E1184A mutants were not investigated further. The values shown are the means (± S.D.) of triplicate determinations in a single experiment and are representative of results obtained in at least one additional independent experiment. Data are corrected for any differences in expression of the mutant proteins relative to wild-type MRP1. Expression levels of Ala-substituted CL7 mutants of MRP1. Shown is an immunoblot of membrane vesicles (1 μg of protein) prepared from HEK 293T cells transfected with cDNA expression vectors encoding wild-type, E1144A, 1169AAQA, R1173A, D1179A, K1181A, and E1184A MRP1 mutants. MRP1 protein levels were detected with mAb QCRL-1 and vesicles from untransfected cells were included as a negative control. The relative expression levels shown under the blot were estimated by densitometry. Photolabeling with 8-Azido-[α-32P]ATP and Vanadate-Induced 8-Azido-[α-32P]ADP Trapping by Ala-Substituted CL7 Mutant MRP1 Proteins. Because the single E1144A and K1181A mutants and the 1169AAQA triple mutant exhibited the most substantial changes in transport activity, their ATP binding and hydrolysis properties were examined. First, these mutants were photolabeled with 8-azido-[α-32P]ATP under conditions that minimized hydrolysis (4°C) to determine whether changes in their transport properties were associated with changes in ATP binding. However, no differences between the photolabeling of the mutants and wild-type MRP1 were observed (Fig. 5A). In contrast, when the mutant proteins were incubated with 8-azido-[α-32P]ATP under conditions that permit hydrolysis and trapping of azidoADP to occur (37°C, 1 mM sodium orthovanadate), some significant differences were noted. Thus, trapping of 8-azido-[α-32P]ADP by the K1181A mutant was 40% lower than for wild-type MRP1. In contrast, increased dinucleotide trapping (1.5- to 1.7-fold) was observed for the E1144A and 1169AAQA mutants (after corrections were made to take into account differences in MRP1 expression) (Fig. 5B). Analysis after mild trypsinolysis to cleave MRP1 in half (Hipfner et al., 1996) showed that the changes in [α-32P]azidoADP trapping by these three mutants occurred in NBD2 in the COOH-proximal half of the transporter, and the relative increases/decreases in trapping by the mutants were similar to those observed in the full-length transporters (Fig. 5C). To determine whether the increased photolabeling under trapping conditions was due to a change in the affinity for azidoADP, additional trapping experiments were performed on the E1144A and 1169AAQA mutants. Thus, a first cycle of dinucleotide trapping was initiated by incubating the membrane vesicles with 8-azido-[α-32P]ATP and vanadate at 37°C for 10 min and then removing free nucleotides by centrifugation as before; membranes were then resuspended in transport buffer and incubated for a further 10 min at 37°C to allow the release of azidoADP (and Pi) from the protein. After centrifugation, membrane proteins were subjected to a second cycle of azidoADP trapping by once again incubating the membranes with 8-azido-[α-32P]ATP and vanadate at 37°C for 10 min. Protein samples from each of the three steps of the above process were washed by centrifugation, and then exposed to UV and subjected to SDS-PAGE as before (Sauna and Ambudkar, 2001; Payen et al., 2003). However, no significant differences in trapping of azidoADP were observed (not shown) indicating that the wild-type and mutant proteins behave in a similar manner with respect to the release, rebinding, and hydrolysis of azidoATP and that the mutations do not affect the function of the NBSs after completing a first cycle of hydrolysis. Effect of E217βG on 8-Azido-[α-32P]ATP Photolabeling and Vanadate-Induced 8-Azido-[α-32P]ADP Trapping by E1144A Mutant MRP1. Because E217βG transport by the E1144A mutant was substantially reduced, the effect of this organic anion substrate on the interactions of the mutant protein with ATP was examined. As shown in Fig. 6A, neither 25 nor 50 μM E217βG caused any detectable change in 8-azido-[α-32P]ATP photolabeling of either the E1144A mutant or wild-type MRP1 at 4°C. We have previously reported that E217βG reduces vanadate-induced trapping of azidoADP by wild-type MRP1 in a concentration-dependent fashion, an observation that was confirmed here (Fig. 6B) (Létourneau et al., 2008). In contrast, E217βG had no effect on vanadate-induced trapping of azidoADP by the E1144A mutant (Fig. 6B). [3H]LTC4 Photolabeling of K1181A Mutant MRP1 Protein. Because the K1181A mutant showed the most significant decrease (45%) in LTC4 transport activity of the seven single Ala mutants, it was of interest to determine whether binding of this substrate was affected by this mutation. However, as shown in Fig. 7, no differences in [3H]LTC4 photolabeling of the K1181A mutant and wild-type MRP1 in their nucleotide-free states were detected after taking in account relative levels of MRP1 expression (Fig. 4). 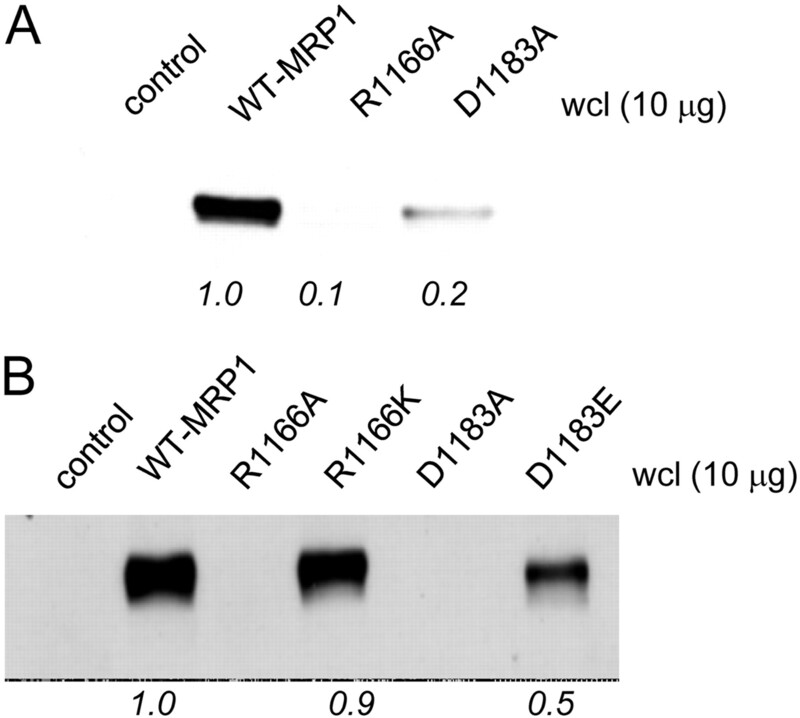 Because vanadate-induced trapping of azidoADP by the K1181A mutant was significantly reduced compared with wild-type MRP1 (Fig. 5, B and C), [3H]LTC4 photolabeling experiments were also carried out using MRP1-enriched membranes in the ATP-bound and “ADP-trapped” (low affinity) states. Under both conditions, low levels of [3H]LTC4 photolabeling were observed for the K1181A mutant (Fig. 7). Similar low levels of labeling of wild-type MRP1 were also observed as expected (Payen et al., 2003). In the present study, we have extended previous mutational analyses of charged residues in CL7 to gain a better understanding of the role(s) this region plays in determining both the expression and activity of MRP1 (Conseil et al., 2006). Thus, we sought further biochemical insights into how CL7 might participate in the stable expression of MRP1 as well as signaling between the MSDs and NBSs of the transporter during ATP-dependent translocation of organic anions across the membrane bilayer. Consequently, we replaced seven CL7 residues with a neutral Ala, and in some instances with an amino acid of the same charge, and then determined the effects on MRP1 expression, transport activity and nucleotide interactions using radiolabeled substrates and azidoATP. Of the seven single-Ala-substituted CL7 mutants generated, only two (R1173A and E1184A) displayed properties that were comparable with those of wild-type MRP1, demonstrating the extreme sensitivity of this cytoplasmic loop to mutation. The remaining five single mutants were either poorly expressed (R1166A, D1183A) (Fig. 2) or exhibited significantly reduced transport levels of one or more organic anions (E1144A, D1179A, K1181A) (Table 1). The transport activity of the triply Ala-substituted 1169AAQA-CL7 mutant was also reduced compared with wild-type MRP1 in a substrate-selective fashion. The poor expression of the R1166A and D1183A mutants indicates that Arg1166 and Asp1183 contribute to the stability of MRP1, probably by influencing the proper folding of the transporter during its biosynthesis. These two residues join a growing list of amino acids that play a critical role in promoting and/or maintaining the stable expression of MRP1 in the plasma membrane of mammalian cells. It is interesting to note that several of the mutations previously identified that eliminate MRP1 expression also involve charged or polar residues but these have been located in NBD1 (Asp792 and Ser685) (Cui et al., 2001; Yang et al., 2008) or in the MSDs (Asp430 in TM7; Arg1202 and Glu1204 in TM16) (Haimeur et al., 2004; Situ et al., 2004). Our present data with the Arg1166 and Asp1183 mutants establish that amino acids located well within a cytoplasmic loop of MRP1 can now be added to this list. Thus, no pattern has yet emerged that allows for the reliable prediction of the location of residues critical for stable expression of MRP1 at the plasma membrane. Elucidation of the post-translational events leading to poor expression of R1166A and D1183A and other low or nonexpressing MRP1 mutants is currently under investigation. It is worth noting that several disease-associated mutations in the analogous loop of CFTR (ABCC7) have been reported to compromise the biosynthetic processing of this related chloride channel (Seibert et al., 1996) indicating that amino acids in this cytoplasmic segment contribute to stable plasma membrane expression in at least two members of the ABCC subfamily of proteins. Our observation that the same-charge D1183E mutant was as poorly expressed at the plasma membrane as the neutrally substituted D1183A is somewhat unexpected, because previously identified expression impaired mutants involving charged residues have typically not exhibited this property (Haimeur et al., 2004; Situ et al., 2004). It is also interesting to note that mutation of the adjacent Glu residue at position 1184, although also negatively charged, had no significant effect on either the expression levels or transport properties of MRP1. The extreme sensitivity of Asp1183 to mutation indicates that not only its charge but also the volume of its side chain is critical for proper folding and expression of MRP1. The observation that extending the Asp1183 side chain by just one methylene group is detrimental to expression suggests that the electrostatic interactions in which Asp1183 normally participates are critical for proper folding during biosynthesis of the transporter and are dependent on a highly structured local environment. Lys1187 is located within one turn of Asp1183 in the CL7 α-helix; thus, it is reasonable to suggest that electrostatic interactions between these two residues might contribute to the structure of this region. Our current homology models of MRP1 suggest no other potential bonding interactions for Asp1183; however, it should be borne in mind that our models represent MRP1 in a nucleotide-bound, outward-facing conformation (DeGorter et al., 2008). Consequently, it is quite possible that additional interactions of Asp1183 with other residues in MRP1 exist when the transporter is in different conformations (e.g., inward-facing, nucleotide-free), as is likely during synthesis and folding of the protein, at different steps during the transport cycle. In contrast to D1183E, the same charge mutant of Arg1166, R1166K, was expressed in membrane vesicles at levels that approached 50% those of wild-type MRP1, and the relative levels of LTC4 and E217βG transport activity of this mutant were comparable with those of wild-type MRP1 after normalization for differences in protein expression levels (Fig. 3). According to our models, Arg1166 is in a short helical region of CL7 in which the helix that begins as TM15 and extends into the cytoplasm then kinks at Gly1161 and continues to Glu1170, before turning back toward the plasma membrane, where it re-inserts to become TM16. Thus, the helical region in which Arg1166 is located is most distal from the membrane and is predicted to be relatively near to NBD1. The analogous helical region has been referred to as “coupling helix 2” in bacterial ABC transporters for which structures have been obtained (Dawson and Locher, 2006), and it is oriented roughly parallel to the plane of the membrane where, in MRP1, it provides the bulk of the contacts between CL7 and NBD1 (Fig. 1B). Proper folding of NBD1 is clearly critical for the correct post-translational folding and stability of the related CFTR (ABCC7), and this seems related to the interaction of NBD1 with other domains of CFTR during its biosynthesis (Du et al., 2005; Mendoza and Thomas, 2007). It may be that certain specific stabilizing interactions between NBD1 and CL7 are also necessary for the proper assembly of MRP1 and that these interactions are disrupted by mutation of Arg1166. 8-Azido-[32P]ATP photolabeling and vanadate-dependent 8-azido-[32P]ADP trapping of CL7 mutants E1144A, 1169AAQA and K1181A of MRP1. A, membrane vesicles (20 μg of protein) were incubated under nonhydrolytic conditions (4°C) with 5 μM 8-azido [α-32P]ATP for 5 min in transport buffer containing 5 mM MgCl2. Samples were then photo-cross-linked and unincorporated nucleotides were removed as described under Materials and Methods. B and C, vanadate-induced trapping of nucleotide was measured by incubating membrane vesicles (20 μg of protein) under conditions permitting hydrolysis (37°C) with 5 μM 8-azido [α-32P]ATP in the absence (-) or presence (+) of 1 mM vanadate (Vi) for 15 min in transport buffer containing 5 mM MgCl2. After removal of unincorporated nucleotides, the samples were photo-cross-linked. C, samples prepared as described in B were digested with trypsin at a trypsin/protein ratio of 1:1000 at 23°C for 10 min. In all cases, samples were resolved by SDS-PAGE. and the dried gels were exposed to film for 1 to 24 h at room temperature. Similar results were obtained in at least two additional independent experiments. The relative levels of azidoADP trapping in A and B were estimated by densitometric analysis of the films. C-ter, COOH-terminal. 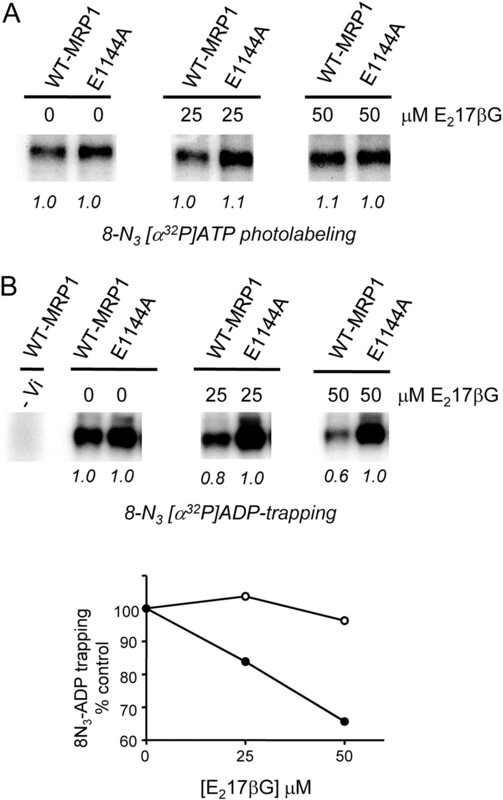 Effect of E217βG on 8-azido-[32P]ATP photolabeling and vanadate-dependent azido-[32P]ADP trapping by MRP1 mutant E1144A. Membrane vesicles (20 μg protein) were preincubated for 10 min on ice with the indicated concentrations of E217βG before being processed for photolabeling with 8-azido-[32P]ATP under nonhydrolytic conditions (4°C) (A) or vanadate-induced azido-[32P]ADP trapping under conditions that permit hydrolysis (37°C) (B). The relative levels of labeling were estimated by densitometric analysis of the films, and for wild-type and E1144A mutant MRP1 are expressed relative to labeling in the absence of substrate. In the lower part of B, the relative levels of vanadate-induced azidoADP trapping by wild-type (•) and E1144A (○) MRP1 have also been plotted against concentration of E217βG. [3H]LTC4 photolabeling of wild-type and K1181A mutant MRP1 in the presence of ATP and trapped ADP. Wild-type (WT-MRP1) and K1181A mutant membrane vesicles (50 μg of protein) were incubated in transport buffer containing 5 mM MgCl2 for 20 min in the absence (-) or presence (+) of ATP (1 mM) and sodium orthovanadate (Vi) (1 mM), alone or in combination, and then incubated with [3H]LTC4 (200 nM, 120 nCi) for a further 30 min followed by UV cross-linking, SDS-PAGE, and fluorography. It is also interesting to note that disease-associated mutations at the position analogous to MRP1-Arg1166 have been identified in several other human ABC transporters, including CFTR (ABCC7) and MRP6 (ABCC6). Thus, the corresponding CFTR-Arg1066 seems to be a “hot spot” for mutations, and persons who have a Cys, Ser, His, or Leu residue in place of CFTR-Arg1066 are reported to be afflicted with pancreatic insufficiency and severe lung disease (Fanen et al., 1992; Férec et al., 1992; Mercier et al., 1993; Cremonesi et al., 1996). Fanen et al. (1997) further found that transfected cells expressing CFTR-R1066C did not respond to cAMP stimulation, and, similar to what we observed with MRP1-R1166A, the mutant CFTR protein was poorly expressed. Moreover, unlike other CFTR-processing mutations, the defect exhibited by CFTR-R1066C could not be corrected in vitro by reduced temperature or treatment with sodium butyrate. Likewise, we found that expression of MRP1-R1166A could not be improved under comparable conditions. The residue in MRP6 (ABCC6) (Arg1138) corresponding to MRP1-Arg1166 also seems to be a mutation hot spot because Pro, Gln, or Trp has been found at this position in persons afflicted with pseudoxanthoma elasticum (Le Saux et al., 2000; Ringpfeil et al., 2000). Finally, when the analogous residue in the yeast cadmium factor Ycf1 was replaced with a cysteine (R1143C), expression of the mutant was significantly reduced (Falcón-Pérez et al., 1999). Together, these observations support the conclusion that at least some of the folding and trafficking steps among ABCC family members are conserved in mammals as well as yeast and are strongly influenced by this basic residue in the COOH-terminal cytoplasmic loop. Unlike the R1166A and D1183A mutants, the second group of functionally altered single Ala-substituted mutants (E1144A, D1179A, K1181A) and the 1169AAQA triple mutant were all expressed at levels comparable with or greater than that of wild-type MRP1 (Fig. 4). However, none of these residues is absolutely critical for MRP1 function because their replacement with Ala caused only moderate (and in the case of D1179A very moderate) and substrate-selective changes in transport activity (Table 1). The limited impact that mutation of these charged residues has on the activity of MRP1 may be related to the fact that they are all outside coupling helix 2 described above. In addition, as shown in the sequence alignments in Fig. 1C, Glu1144, Asp1179, and Lys1181 and the three Glu residues in the 1169EEQE cluster, are only moderately conserved among MRP homologs, whereas previous studies of MRP1 and other ABC transporters have shown that functionally important residues are often quite well conserved (Haimeur et al., 2002, 2004; Ito et al., 2003; Payen et al., 2003; Situ et al., 2004; Conseil et al., 2006; Deeley et al., 2006). It has long been speculated that the cytoplasmic loops of ABC proteins somehow link the NBSs to the MSDs to couple ATP binding and hydrolysis to affect transport or channel activity (Xie et al., 1995; Cotten et al., 1996). This hypothesis has recently been strengthened substantially by high-resolution crystal structures of several bacterial ABC transporters, including the multidrug half-transporter Sav1866 from S. aureus, which bears significant sequence homology to MRP1 (Dawson and Locher, 2006, 2007; DeGorter et al., 2008). As mentioned above, the 3.0-Å resolution structure of the Sav1866 homodimer crystallized in the presence of nucleotides represents the open/outward conformation of this ABC transporter. In this conformation, the NBDs are in a closed “sandwich” dimer configuration, and the substrate translocation pathway or “pore” is exposed to what would be the extracellular face of the membrane. In this structure, both CLs from one of the MSDs form interactions with each of the two NBDs. CL2 of Sav1866, which is relatively conserved as CL7 of MRP1 (Fig. 1C), is located between TM4 and TM5, an ideal position for transducing conformational changes from the MSD to the NBSs and vice versa (Dawson and Locher, 2006, 2007). Not surprisingly, our models of human MRP1 generated using the Sav1866 crystal structure as template show that CL7 is similarly well placed to mediate signaling between MSD2 and the NBSs (Fig. 1B) (DeGorter et al., 2008). The altered transport activity and nucleotide interactions of the E1144A, K1181A, and 1169AAQA mutants may thus result from perturbation of this signaling (Table 1, Fig. 5). The observation that E217βG failed to inhibit vanadate-induced trapping of azidoADP by the E1144A mutant, as it does with wild-type MRP1 (Fig. 6), suggests that the signaling that occurs after E217βG interacts with its binding site in the MSDs of E1144A has become at least partially uncoupled from the hydrolysis of ATP (or release of ADP) at NBD2/NBS2. It may be that the mutant does not bind E217βG as well as the wild-type transporter. At present, the molecular details of how precisely perturbations in signaling might be effected are unclear. Our three-dimensional models indicate that none of the amino acids investigated here is predicted to be facing into the substrate translocation pathway of MRP1 or to be in a position to interact directly with residues in the NBSs known to be important for the catalytic activity of the transporter, at least when it is in its nucleotide-bound conformation. Thus, it seems likely that they participate in signaling between the two NBSs and the MSDs rather than interacting directly with substrate. In summary, our present and previous studies firmly establish the importance of the integrity of CL7 for MRP1 function and further demonstrate the complex and individual role that multiple specific individual amino acids in CL7 have on the expression, transport activity and/or nucleotide interactions of MRP1. The requirement of the highly conserved Arg1166 and Asp1183 for proper folding and expression of MRP1, at least in mammalian cells, suggests that certain specific structural aspects of CL7 are critical for the proper folding of this transporter into a stable and active conformation at the plasma membrane. On the other hand, Glu1144 and Lys1181 and one or more of the Glu residues at positions 1169, 1170, and 1172 seem to play a role in the signaling interactions between the MSDs and NBSs that are necessary for the transport and catalytic functions of MRP1. Ren et al. (2006) have recently confirmed the importance of CL7 in MRP1 function by substituting the highly conserved Glu1157 and Gly1161 with Leu and Pro, respectively. They found that the double-mutant E1157L/G1161P no longer transported LTC4 and could not be labeled with the photoaffinity ligand azidoAgosterol A. Unlike the CL7 mutants we have described, however, the double mutant could no longer be photolabeled with azidoATP, and vanadate-induced trapping of azidoADP was reduced at both NBDs. Thus, for reasons that are presently unclear, the interactions of the double E1157L/G1161P mutant with nucleotide differ substantially from those of the CL7 mutants we have described here and elsewhere (Conseil et al., 2006). Ren et al. (2006) also created the analogous double mutant (E507L/G511P) in CL5, the cytoplasmic loop that connects TM10 to TM11, and is predicted to be in contact with NBD2 (DeGorter et al., 2008). Ongoing studies are aimed at further analysis of the apparently distinct but clearly critical roles that CL5 and CL7 play in promoting stable MRP1 expression and/or the interdomain signaling that occurs between the MSDs and NBSs of this transporter. We thank K. Sparks, D. Situ, and Drs. E. M. Leslie and K. E. Weigl for technical contributions and M. Hobbs for assisting in the preparation of the figures and the manuscript. This work was supported by the Canadian Institutes of Health Research [Grants MOP-10519, MFE-49874, MFE-81528]. ABBREVIATIONS: ABC, ATP-binding cassette; MRP, multidrug resistance protein; MSD, membrane-spanning domain; NBD, nucleotide binding domain; NBS, nucleotide binding site; PMSF, phenylmethylsulfonyl fluoride; LTC4, leukotriene C4; HEK, human embryonic kidney; PMSF, phenylmethylsulfonyl fluoride; PAGE, polyacrylamide gel electrophoresis; TM, transmembrane; MTX, methotrexate; E217βG, 17β-estradiol-17-β-(d-glucuronide); CFTR, cystic fibrosis transmembrane conductance regulator; E13SO4, estrone 3-sulfate; mAb, monoclonal antibody. ↵1 Current affiliation: Department of Biological Sciences, University of Warwick, Coventry, United Kingdom. Bakos E, Evers R, Szakács G, Tusnády GE, Welker E, Szabó K, de Haas M, van Deemter L, Borst P, Váradi A, and Sarkadi B (1998) Functional multidrug resistance protein (MRP1) lacking the N-terminal transmembrane domain. J Biol Chem 273: 32167-32175. Bakos E, Evers R, Calenda G, Tusnády GE, SzakácsG,Váradi A, and Sarkadi B (2000) Characterization of the amino-terminal regions in the human multidrug resistance protein (MRP1). J Cell Sci 113: 4451-4461. Conseil G, Deeley RG, and Cole SPC (2005) Role of two adjacent cytoplasmic tyrosine residues in MRP1 (ABCC1) transport activity and sensitivity to sulfonylureas. Biochem Pharmacol 69: 451-461. Conseil G, Deeley RG, and Cole SPC (2006) Functional importance of three basic residues clustered at the cytosolic interface of transmembrane helix 15 in the multidrug and organic anion transporter MRP1 (ABCC1). J Biol Chem 281: 43-50. Cotten JF, Ostedgaard LS, Carson MR, and Welsh MJ (1996) Effect of cystic fibrosis-associated mutations in the fourth intracellular loop of cystic fibrosis transmembrane conductance regulator. J Biol Chem 271: 21279-21284. Cremonesi L, Cainarca S, Rossi A, Padoan R, and Ferrari M (1996) Detection of a de novo R1066H mutation in an Italian patient affected by cystic fibrosis. Hum Genet 98: 119-121. Cui Y, König J, Buchholz JK, Spring H, Leier I, and Keppler D (1999) Drug resistance and ATP-dependent conjugate transport mediated by the apical multidrug resistance protein, MRP2, permanently expressed in human and canine cells. Mol Pharmacol 55: 929-937. Cui L, Hou YX, Riordan JR, and Chang XB (2001) Mutations of the Walker B motif in the first nucleotide binding domain of multidrug resistance protein MRP1 prevent conformational maturation. Arch Biochem Biophys 392: 153-161. Dawson RJ and Locher KP (2006) Structure of a bacterial multidrug ABC trans-porter. Nature 443: 180-185. Dawson RJ and Locher KP (2007) Structure of the multidrug ABC transporter Sav1866 from Staphylococcus aureus in complex with AMP-PNP. FEBS Lett 581: 935-938. DeGorter MK, Conseil G, Deeley RG, Campbell RL, and Cole SP (2008) Molecular modeling of the human multidrug resistance protein 1 (MRP1/ABCC1). Biochem Biophys Res Commun 365: 29-34. Du K, Sharma M, and Lukacs GL (2005) The ΔF508 cystic fibrosis mutation impairs domain-domain interactions and arrests post-translational folding of CFTR. Nat Struct Mol Biol 12: 17-25. Falcón-Pérez JM, Mazón MJ, Molano J, and Eraso P (1999) Functional domain analysis of the yeast ABC transporter Ycf1p by site-directed mutagenesis. J Biol Chem 274: 23584-23590. Fanen P, Ghanem N, Vidaud M, Besmond C, Martin J, Costes B, Plassa F, and Goossens M (1992) Molecular characterization of cystic fibrosis: 16 novel mutations identified by analysis of the whole cystic fibrosis conductance transmembrane regulator (CFTR) coding regions and splice site junctions. Genomics 13: 770-776. Fanen P, Labarthe R, Garnier F, Benharouga M, Goossens M, and Edelman A (1997) Cystic fibrosis phenotype associated with pancreatic insufficiency does not always reflect the cAMP-dependent chloride conductive pathway defect. Analysis of C225R-CFTR and R1066C-CFTR. J Biol Chem 272: 30563-30566. Férec C, Audrezet MP, Mercier B, Guillermit H, Moullier P, Quere I, and Verlingue C (1992) Detection of over 98% cystic fibrosis mutations in a Celtic population. Nat Genet 1: 188-191. Gao M, Yamazaki M, Loe DW, Westlake CJ, Grant CE, Cole SP, and Deeley RG (1998) Multidrug resistance protein: identification of regions required for active transport of leukotriene C4. J Biol Chem 273: 10733-10740. Hipfner DR, Almquist KC, Leslie EM, Gerlach JH, Grant CE, Deeley RG, and Cole SPC (1997) Membrane topology of the multidrug resistance protein (MRP). A study of glycosylation-site mutants reveals an extracytosolic terminus. J Biol Chem 272: 23623-23630. Ito K, Olsen SL, Qiu W, Deeley RG, and Cole SPC (2001) Mutation of a single conserved tryptophan in multidrug resistance protein 1 (MRP1/ABCC1) results in loss of drug resistance and selective loss of organic anion transport. J Biol Chem 276: 15616-15624. Ito K, Weigl KE, Deeley RG, and Cole SPC (2003) Mutation of proline residues in the NH2-terminal region of the multidrug resistance protein, MRP1 (ABCC1): effects on protein expression, membrane localization, and transport function. Biochim Biophys Acta 1615: 103-114. Kast C and Gros P (1998) Epitope insertion favors a six transmembrane domain model for the carboxy-terminal portion of the multidrug resistance-associated protein. Biochemistry 37: 2305-2313. Koike K, Conseil G, Leslie EM, Deeley RG, and Cole SP (2004) Identification of proline residues in the core cytoplasmic and transmembrane regions of multidrug resistance protein 1 (MRP1/ABCC1) important for transport function, substrate specificity, and nucleotide interactions. J Biol Chem 279: 12325-12336. Le Saux O, Urban Z, Tschuch C, Csiszar K, Bacchelli B, Quaglino D, Pasquali-Ronchetti I, Pope FM, Richards A, Terry S, et al. (2000) Mutations in a gene encoding an ABC transporter cause Pseudoxanothoma elasticum. Nat Genet 25: 223-227. Leslie EM, Létourneau IJ, Deeley RG, and Cole SPC (2003a) Functional and structural consequences of cysteine substitutions in the NH2-proximal region of the human multidrug resistance protein 1 (MRP1/ABCC1). Biochemistry 42: 5214-5224. Leslie EM, Deeley RG, and Cole SPC (2003b) Bioflavonoid stimulation of glutathione transport by the 190-kDa multidrug resistance protein 1 (MRP1). Drug Metab Dispos 31: 11-15. Leslie EM, Deeley RG, and Cole SPC (2005) Multidrug resistance proteins: role of P-glycoprotein, MRP1, MRP2 and BCRP (ABCG2) in tissue defense. Toxicol Appl Pharmacol 204: 216-237. Létourneau IJ, Deeley RG, and Cole SPC (2005) Functional characterization of non-synonymous single nucleotide polymorphisms in the gene encoding human multidrug resistance protein 1 (MRP1/ABCC1). Pharmacogenet Genomics 15: 647-657. 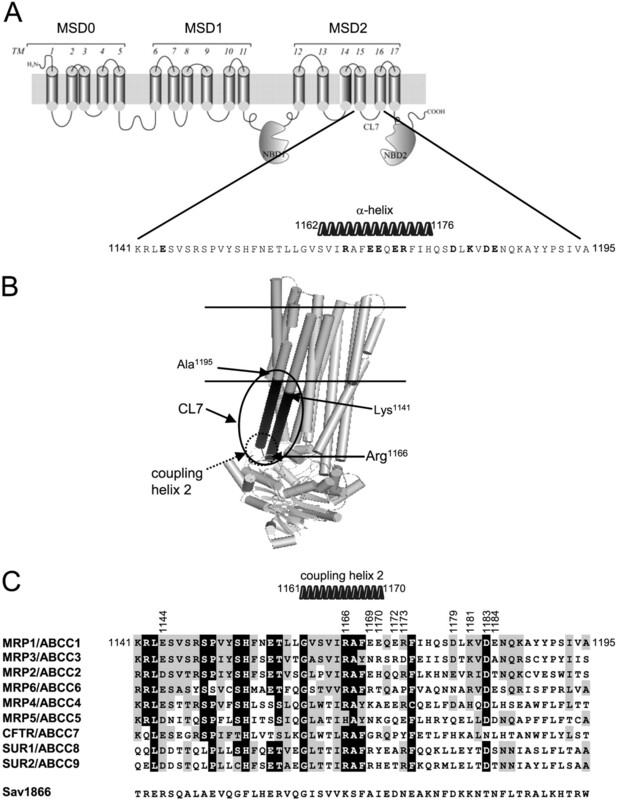 Létourneau IJ, Nakajima A, Deeley RG, and Cole SPC (2008) Role of proline 1150 in functional interactions between the membrane spanning domains and nucleotide binding domains of the MRP1 (ABCC1) transporter. Biochem Pharmacol 75: 1659-1669. Locher KP, Lee AT, and Rees DC (2002) The E. coli BtuCD structure: a framework for ABC transporters architecture and mechanism. Science 296: 1091-1098. Loe DW, Almquist KC, Deeley RG, and Cole SPC (1996) Multidrug resistance protein (MRP)-mediated transport of leukotriene C4 and chemotherapeutic agents in membrane vesicles: demonstration of glutathione-dependent vincristine transport. J Biol Chem 271: 9675-9682. Mercier B, Lissens W, Novelli G, Kalaydjieva L, De Arce M, Kapranov N, Klain NC, Lenoir G, Chauveau P, Lenaerts C, et al. (1993) Identification of eight novel mutations in a collaborative analysis of a part of the second transmembrane domain of the CFTR gene. Genomics 16: 296-297. Mendoza JL and Thomas PJ (2007) Building an understanding of cystic fibrosis on the foundation of ABC transporter structures. J Bioenerg Biomembr 39: 499-505. Müller M, Yong M, Peng XH, Petre B, Arora S, and Ambudkar SV (2002) Evidence for the role of glycosylation in accessibility of the extracellular domains of human MRP1 (ABCC1). Biochemistry 41: 10123-10132. Payen LF, Gao M, Westlake CJ, Cole SP, and Deeley RG (2003) Role of carboxylate residues adjacent to the conserved core Walker B motifs in the catalytic cycle of multidrug resistance protein 1 (ABCC1). J Biol Chem 278: 38537-38547. Ren XQ, Furukawa T, Yamamoto M, Aoki S, Kobayashi M, Nakagawa M, and Akiyama S (2006) A functional role of intracellular loops of human multidrug resistance protein. J Biochem (Tokyo) 140: 313-318. Ringpfeil F, Lebwohl MG, Christiano AM, and Uitto J (2000) Pseudoxanthoma elasticum: mutations in the MRP6 gene encoding a transmembrane ATP-binding cassette (ABC) transporter. Proc Natl Acad Sci U S A 97: 6001-6006. Sauna ZE and Ambudkar SV (2001) Characterization of the catalytic cycle of ATP hydrolysis by human P-glycoprotein. The two ATP hydrolysis events in a single catalytic cycle are kinetically similar but affect different functional outcomes. J Biol Chem 276: 11653-11661. Seibert FS, Linsdell P, Loo TW, Hanrahan JW, Clarke DM, and Riordan JR (1996) Disease-associated mutations in the fourth cytoplasmic loop of cystic fibrosis transmembrane conductance regulator compromise biosynthetic processing and chloride channel activity. J Biol Chem 271: 15139-15145. Situ D, Haimeur A, Conseil G, Sparks KE, Zhang D, Deeley RG, and Cole SPC (2004) Mutational analysis of ionizable residues proximal to the cytoplasmic interface of membrane spanning domain 3 of the multidrug resistance protein, MRP1 (ABCC1): glutamate 1204 is important for both the expression and catalytic activity of the transporter. J Biol Chem 279: 38871-38880. Xie J, Drumm ML, Ma J, and Davis PB (1995) Intracellular loop between transmembrane segments IV and V of cystic fibrosis transmembrane conductance regulator is involved in regulation of chloride channel conductance state. J Biol Chem 270: 28084-28091. Yang R, Scavetta R, and Chang XB (2008) The hydroxyl group of S685 in Walker A motif and the carboxyl group of D792 in Walker B motif of NBD1 play a crucial role for multidrug resistance protein folding and function. Biochim Biophys Acta 1778: 454-465.